Editor's note: This post originally appeared in December 2014 and has been updated and revamped for accuracy. Joining a fitness class is a fun way to lose weight, and finding the group exercise classes that will burn the most calories is usually the goal of any person on a weight loss mission. 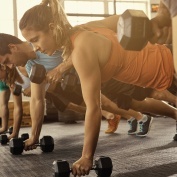 With Turbo Kick, you’ll burn a ton of calories in a fun class and see results fast. If you are looking for Sacramento Turbo Kick classes, look no further than California Family Fitness. Interested in getting and staying in shape? The Turbo Kick workout is a group exercise class that combines the intensity of kickboxing with the fun, creative choreography of a dance class. 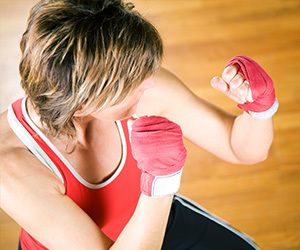 You don’t even have to have any previous kickboxing or dance experience. Just bring your excitement and a towel to wipe up the sweat from all the calorie burning you’ll be doing. Your highly trained fitness instructor will guide you through all the heart pumping moves like kicking, punching, and shuffling, all to the high energy beats of great music. How Many Calories Does Turbo Kick Burn? Because a Turbo Kick class combines cardio, intervals, and strength training, you can burn over 500 calories in each class. Get stronger, leaner, and more fit with a class that is so fun, it flies by in the blink of an eye. Follow that up with a clean diet full of lean protein and healthy vegetables, and you’ll be dropping pounds of fat in no time at all. You also get the added benefit of increased hand eye coordination. The mental challenge of Turbo Kick training keeps your brain challenged, and your mind alert. Finding a convenient Turbo Kick class is easy. Just visit the Cal Fit website and choose your gym from the list of locations in the Sacramento and surrounding area. Then you can view the class schedule and find a class at a time that suits you best. Once you start Turbo Kick, you’ll be hooked!